FREEMAN, S.D. — The Keystone pipeline will restart Saturday morning, less than a week after passersby noticed a sheen of oil on the surface in a ditch near here. The ensuing excavation and cleanup operation brought more than 100 contractors and TransCanada employees to the site, where backhoes pulled masses of oil-soaked soil away to expose 275 feet of pipe and search it for the source of the leak. That source was found Friday morning, and the federal Pipeline and Hazardous Materials Safety Administration gave the company the go-ahead for a conditional re-start that afternoon. The pipeline will operate at reduced pressure initially as aerial and ground crews monitor the situation, TransCanada spokesman Mark Cooper wrote in a news release. “We expect to be at full operation by end of day tomorrow,” Cooper said Friday. The pipeline transports 590,000 barrels of oil a day from Alberta Province in Canada to Port Arthur, Texas. As workers searched for the leak, the estimate of the spill's size grew from 187 gallons to nearly 17,000. The initial estimate reported to the Coast Guard’s National Response Center was based on the amount observed upon initial inspection, said Doug Harvey, vice president of liquid field operations. Soils were tested for the presence of oil, with saturated soils separated from clean soils, said Mark Yeomans, the company’s vice president of pipeline integrity. Modeling based on the amount of extracted dirt led to the updated figure of 400 barrels, equal to to 16,800 gallons. Piles of soil were placed on plastic on the ground at the site for the saturated soils. Some of it was hauled to Freeman, about 50 miles west of Sioux Falls, S.D., and stored on the site of a construction contractor. “We have limited space, so we are trucking it to away to other facilities,” Yeomans said. Large metal above-ground storage tanks were filled throughout the excavation process with oil and contaminated water for future disposal. The cleanup process has begun and will continue until regulators are satisfied that all the oil has been removed from the affected area. “At this time, we’re not sure how long it will take. It will really depend upon the extent of the contamination,” Harvey said. No aquifers were close to the spill site, said Bryan Walsh of the South Dakota Department of Environment and Natural Resources. Crews haven’t run into any wells during cleanup, Yeomans said Friday. 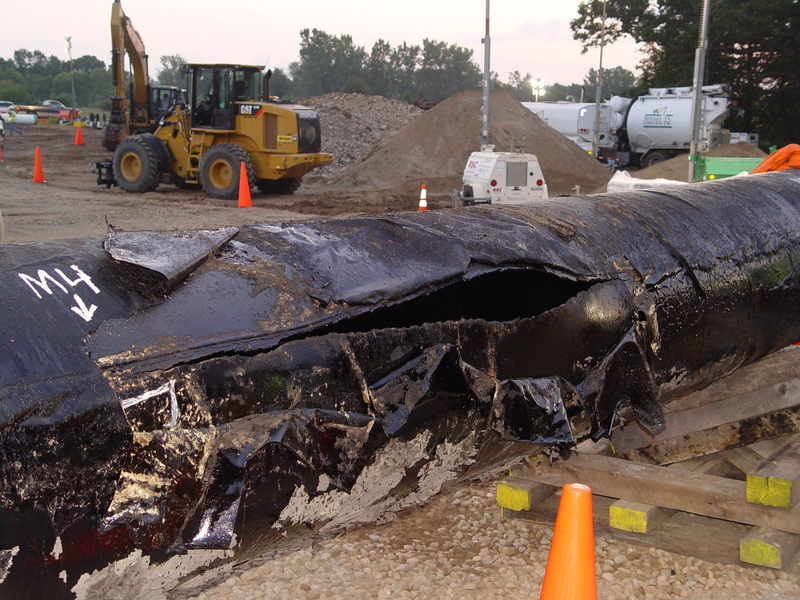 Groups opposed to the initial Keystone pipeline and the yet-unbuilt KeystoneXL pipeline have called the spill a sign of the ongoing dangers posed by underground oil transfer. The Rosebud Sioux Tribe of Rosebud, S.D., intervened in the state Public Utilities Commission’s permitting hearings for both pipelines. On Friday, the tribe released a statement saying the leak was proof that pipelines — even modern pipelines — are more dangerous than advertised. Most disconcerting to the tribe is that a citizen detected the spill and not the pipeline’s alert system, the tribe's letter said.